We here at SYNC are constantly juggling many hats, so who better to chat with about balancing a multi-hyphenated career than photographer/actress/director (and SYNC client) Denice Duff. Question: How would you describe your photographic style? Denice: Fun, spontaneous, natural, not too produced or retouched, and very personal! What is your favorite camera (or equipment) to use? 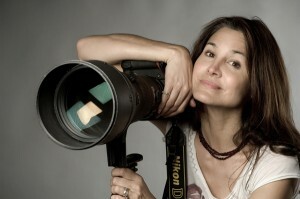 Denice: I am in love with my 5D Mark 2 and my prime 85mm 1.8lens. I’ve been shooting music videos with it as well, and its just heaven. It’s so easy to make an impact with that full frame and the great Canon fast lenses. Does being an actress yourself help you connect with the actors and musicians you shoot? Denice: Absolutely! I am able to cut to the chase to get the emotional response I need. I know how to give the direction that will keep them extroverted. For example, I usually won’t say, “Think of something that makes you happy.” I’ll first test the professionalism of my talent by saying “Laugh!” or “Look a little angrier” and you’d be surprised how easy it is to snap in and out and not get overly emotional. It makes for a quick productive shoot. Also, when I shoot an actor, I always find out if they are a musician as well because I personally find musicians intensely interesting. Their art is not usually about their exterior looks and when I find the “musician” in an actor they tend to free up and become a more relaxed subject. Are acting and photography similar in any respect? How do you juggle both as a career?